It’s funny to think that for centuries, carrying around our luggage was a thing of constant hefting and straining. It wasn’t until 1970 that Bernard Sadow had the idea for wheeled luggage that anyone seemingly took any time to try to figure out a way to make carrying luggage easier. Even after Mr. Sadow filed his patent, the industry didn’t take off until the 1990s, but as a result, today’s travelers now have it easy when they need to travel with large luggage; simply pull up the retractable handle and wheel away to your destination. This travel item has gotten so popular that the market is literally flooded with these mobile travel accessories, so we have put together this guide to make your search for your next piece of spinner luggage much easier. Our Gold Pick product is manufactured by Rockland Luggage. 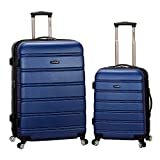 This is a great hard shell-type luggage set that is designed to provide durable storage for all of your belongings. This type is perfect when you expect your stuff to go through a tough treatment on your trip. It’s comprised of ABS plastic, a durable material that is flexible enough to not take dents and durable enough to take a nasty fall. Aesthetically, this spinner suitcase set looks very attractive. Its hard shell construction is textured and somewhat glossy. The set comes with two pieces of luggage; a large and a small. Both pieces, share an almost identical design aesthetic, save for the fact that the smaller of the two tapers a little more at the base. 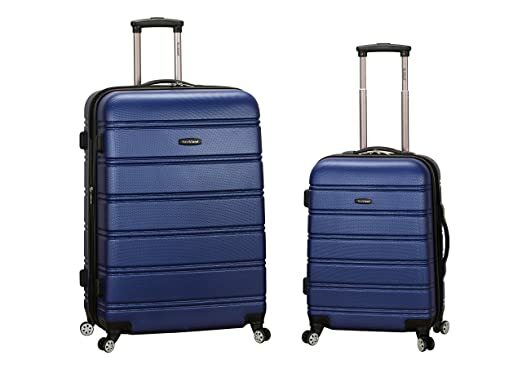 Both suitcases also feature the same ridged design that makes the two pieces of luggage look cushioned. Since these suitcases come as a pair, it’s easy to use one as your check-in luggage and the other as a carry-on, or you can use one for yourself and the other for your significant other or child. The smaller bag measures in at 20 inches high, 13 inches wide and nine inches in depth and only weighs about six pounds unencumbered; the perfect size for an overhead compartment. The larger suitcase is 28 inches high, 17 inches wide, and approximately 12 inches deep and weighs about ten pounds with nothing in it. This suitcase is a great for checking in; it even features a smaller telescoping handle, so that it won’t easily catch and broken by careless baggage handlers. Rockland also has given its customers a large selection of colors for this set. 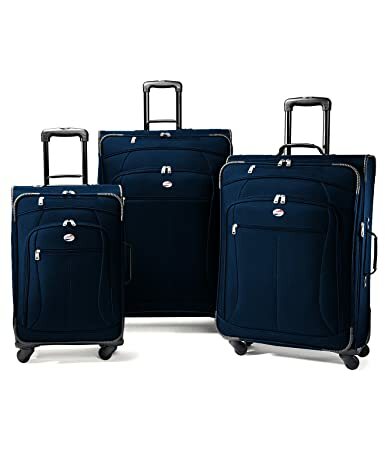 This spinner suitcase set comes in blue, orange, purple, black, silver, champagne, pink, red, turquoise, magenta, brown, charcoal, gold, green, gray, lime, mint, navy, white, and yellow. With so many choices, you can easily select a color that best goes with your own personal style as well as your home’s décor. Since this luggage set is comprised of ABS plastic, it may be prone to scratches and scuffs. ABS, as a rule, isn’t quite as durable and damage resistant as polycarbonate, but despite external marring, it will provide some great protection for your possessions. The wheels on this luggage are of a 360 degree rotational type, so you won’t have to too much when you have to move laterally. Also, these types of wheels make it very easy to maneuver when you are on those long airport lines for check-in. Internally, the luggage is split into two compartments, which are separated by an x-strap and a middle divider. Because of this, you’ll have to fully open this luggage to access both sides equally. Rockland offers a three year warranty on our Gold Pick luggage. American Tourister has been crafting great travel containers since 1933. Today, it has become one of the largest luggage brands in the world. 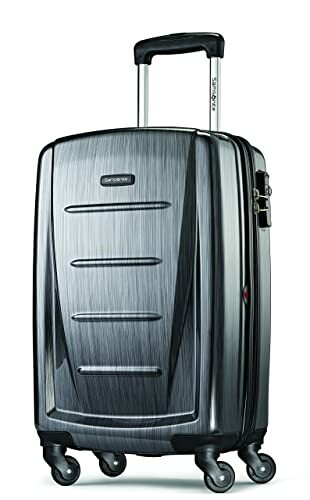 Our Silver Pick, American’t Tourister’s Pop spinner luggage is also the first soft-sided spinner luggage on our list, and it also has the distinction of being the only luggage set in the guide that features three well-designed components. Firstly, this is a very aesthetically pleasing luggage set. Each of its three pieces is identical, yet at three distinct scales. Each looks very padded and is comprised of 100 percent durable polyester. Each of the outside corners is protected by a strong plastic molding that will reduce the chance of your valuables being broken in check-in. There are several stitched lines on the outside of this very padded suitcase set that add a sense of style to the whole collection. • Largest: The largest suitcase measures in at 29 inches in height, 20 inches in width and 10 inches in depth. This piece has tons of room for a trip lasting for several days, if not weeks. • Middle: This suitcase measures 25 inches in height, 18 inches in width, and 8.75 inches in depth. This one is almost the right size to stow, but it’s better left checked with the larger unit. • Smallest: The perfect carry-on luggage, this piece measures 21 inches in height, 14 inches in width, and 7.5 inches in depth. This set comes in a choice of five different colors: navy, black, purple, aqua blue, and orange. Each is fronted in a very plush soft polyester material that simultaneously is thick enough to protect your stuff and also resistant to marring and fraying. The wheels for this set are all 360 degree spinning and are relatively small, so be careful on uneven ground. Internally, this each piece has a goodly amount of space and includes inside straps to keep your clothes and items secure. The inside of the main flap features netting, so that you’ll be able to store smaller, flatter items like ties and socks. This luggage also has a very impressive warranty; American Tourister backs this luggage for a full ten years. Not many luggage brands have as sterling a reputation for being tough to damage as Samsonite. Samsonite has been making durable, quality luggage for over a century. Over its long history, the company has manufactured products that have seen to the safety of the belongings of millions, a tradition that continues in its current line of products. This suitcase is the second hard shell case on our list and it has a sturdy construction that lives up to its manufacturer’s name. When looking at this well-designed suitcase, you might think that it is made of steel. The lines that make up its shaping look hewn from a very strong metal. There are internal curves, indented surfaces, and gripping ridges that are aesthetically impressive. In addition to this, it has a “brushstroke” exterior that features vertical lines. These lines work excellently to hide any scratches that occur due to the wear and tear that luggage is typically subjected to. This is a relatively carry on-friendly piece of luggage. Its measurements are 20 in height, 13.5 inches in width, and 9.5 inches in depth. 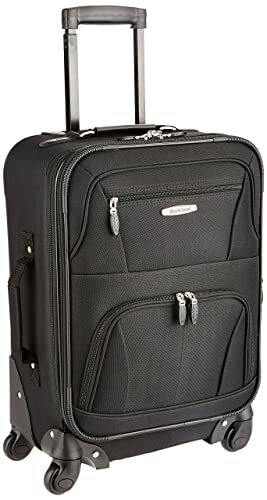 Just remember, if you are planning on taking this luggage onboard as a carry on, that it’s a hard shell, polycarbonate suitcase, meaning that it won’t have much in the way of give when if you try to squeeze it into a overhead compartment. This product comes with an option of six distinct colors, which include: charcoal, orange, purple, burgundy, deep blue, and grey. The suitcase also has a top mounted handle for gripping, a side handle for carrying it like a traditional suitcase, and three plastic feel on the bottom for setting the luggage down. As a spinner, it of course utilizes four 360 degree spinning wheels at its base. These wheels are relatively small and are durable enough to withstand a few dings. As a Samsonite product, you can expect durability as well as security, and in both of these realms this luggage excels. As mentioned before, this luggage has a tough polycarbonate construction that is also lighter than luggage that’s comprised of metal. It’s also rounded on several surfaces in order to provide more shock absorption for breakable items. Finally, to provide a great level of security, this luggage features a TSA approved integrated locking system on the side its side. Samsonite has packed in a lot of protection into this suitcase, but if the unfortunate does occur, the company also backs this product with a ten year warranty. Internally, there are two separate compartments separated by a fabric panel that has mesh storage for small items. Each side is protected by compression straps that will secure your belongings safely. If you need extra space, the mid section of the bag will expand so that you’ll have the room you need. Our Ballin Pick is the second Rockland Luggage product on our list. Unlike the first spinner, this piece of sturdy luggage is of a soft-side design. It has some great, soft-looking curves but proves to be uniquely sturdy with a 100 percent polyester construction. The front is soft, so that all of your precious travel materials are protected from impact. The external shell has quite a few stitches lines that really provide a sleek-looking aesthetic to this piece of luggage. In the front you’ll also notice two large pockets which are perfect for storing travel documents and boarding passes. As a carry on sized bag, this spinner measures in at 21.3 inches high, 14.6 wide, and has a depth of 8.7 inches. When it’s empty it weighs a little more than eight pounds. It also comes in four colors, black, charcoal, purple, and orange. The four spinner wheels at its base are skate types, which will easily spin 360 degrees, and the retractable handle will extend almost two additional feet at its maximum extension. The internal compartment of this suitcase is spacious, sports a full lining, and has straps and a door compartment to secure any items that need it. The first devices of this type weren’t very stable and tended to get bounced everywhere when you hit a bump or crack. Dependent on the type of castor that your luggage rolls on, this can still be a problem. With unstable wheels, you’ll find that the merest jounce will cause you to momentarily lose control of your belongings. For the sake of stability, seek out wheels that are larger as these types are a lot less likely to get caught up on topographical features like cracks in the sidewalk or on the edge of curbs. Also, since this guide is primarily dealing with spinner types of luggage (that’s the four wheeled type), you should be sure that your spinners don’t have any foreign objects jamming the wheel assembly. Because Since this type of luggage depends on these castors working uninterruptedly, any obstruction can be disastrous to your luggage’s stability. Soft: This type is much more flexible than the other; and as a general rule, you’ll be able to squeeze more into a soft-sided spinner suitcase than into a hard shell. Typically, these come in either Cordura, which is a woven nylon fabric, or ballistic nylon. Each of these types can pick up abrasions over the year, but they tend to be very durable under most situations, though tearing isn’t unheard of. Hard: Hard shell luggage tends to provide a lot of protection for your valuables. If you have breakables that you need to protect, this type of spinner luggage might be for you. Also, this type tends to have integrated locks, so security is stronger with these, as a rule. If you fear the damage that careless luggage handlers can inflict on your belongings, this is your luggage. On the flipside, there are a few caveats. Firstly, these suitcases are unyielding, so forget about trying to stuff them into a tight area, and secondly, they can scratch very easily. Two Wheeled: Also known as rollers, these are the luggage types that you drag behind you. These can be a bit uncomfortable when you have to drag a lot of weight behind you, and some travelers have reported shoulder and neck issues after continuous use. Also, since the wheels are recessed, they will infringe on your storage space. Four Wheeled: These are the spinners that we’ve primarily covered in this guide. Spinners tend to offer the most ease of use when taking a long trip with a lot of luggage. When you are in a line, you can simply push your luggage along in front of you. Some models even have hybridized back wheels that will allow you to pull one of these along like a roller. There is one caveat though: since these types have exposed wheels, it’s very easy for a uncaring handler to accidentally snap them off. Let’s be honest, baggage handlers can be the absolute enemy of your efforts to maintain the health and reliability of your favorite luggage. During transit by air or by sea, it’s easy for a piece of luggage to be tossed unceremoniously and get cracked on a wheel, or get torn on a jagged edge. When this happens, it’s good to know that you’re covered by a manufacturer’s warranty, so that you can either get your damage luggage replaced or repaired. Travelling frequently requires travel companions that are reliable and durable as well. A versatile piece of spinner luggage is a great way to easily get to where you’re going without straining your muscles lifting your heavy gear. The spinners that we’ve reviewed in this guide are some of the best on the market, and will serve you well should you choose to purchase them, but if these don’t work for you, don’t neglect to take a look at our pre-purchase considerations; they’ll guide you to the suitcase that’ll fit your needs perfectly.